A fabulous new softer feel sock designed by Feis Fayre. Ultra White and with Cooltex technology, our new sock has already proven to be a market leader. All sizes are Ankle Length, therefore the shorter sock gives the appearance of extended leg length on stage. 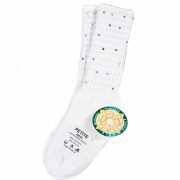 As always Feis Fayre strive to give you the best prices in the market so try out our new great value sock today! Buy 4 pairs for £10 – please make sure to say what sizes you would like in the Order Notes at Checkout.